We played this last night. It's a game of machine building, input and output power sources, and pipe laying. Vaguely reminiscent of the old school Waterworks, only way more technical. It doesn't sound like a lot of fun, and it definitely isn't one of the prettier board games I've seen, so I wasn't sure what to think. I don't know if it was the "post-birthday" sugar coma or the after effects of a house full of shrieking 5-year-old girls... but this one was a bumbling, brain fogging, head scratcher! It took us about 90 minutes to play from set-up to completion. Two of us have never played it before so the initial rules and strategy explanation was slow and overwhelming. My husband caught onto the concept quicker than I, although he hit a major stumbling block when he cleared his factory floor completely and then couldn't reassemble all his machines the same way. His blunder, however, game me a good half hour to leisurely peruse the rules while he tried to lay his pieces again. I can't say that by the end of play, I had completely caught on, but I was taking more risks in grabbing machines. We discovered a significant error on my board about halfway through the game, as well, where I had inputted into an output piece, or something like that. A few hastily purchased pieces of pipe fixed it right up, though. By the end I was letting my husband tell me what pieces to play where. In other board games, his habit of "helping" pisses me off. Last night, I actually found myself asking for his advice. From a fluke of luck, or my lack of impulsivity in the grabbing pieces round, I didn't come in dead last. The engineer at the table won, actually, so of course I accused him of stacking the odds in his favour. He insisted, "No, no, I normally lose," and "I'm not that kind of engineer!" Hmm... maybe he's a Ticket to Ride engineer ... but I digress. 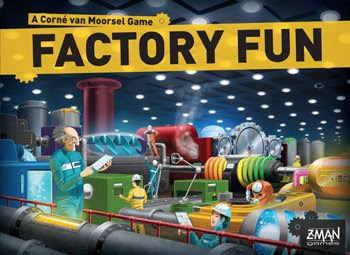 Factory Fun is a puzzle game (I'd venture to say a very complicated puzzle game) and I love puzzle games. I'm generally quite good at them. And I did find myself wishing it was a few rounds longer as it started to make more sense to me. But I'm not going to judge it by my virgin experience... it was awkward, messy, and frustrating. It left me feeling unsatisfied and wishing it had lasted just a little longer. But I can already tell that it'll get easier, so it's definitely a game that deserves a second play. I am glad that you shared this amazing post with us!! I really like it!